A concert to celebrate the release on 31 May of Apollo5’s new album ‘O Radiant Dawn’. Join us for a celebratory evening at the Gresham Centre with VOCES8, Apollo5 and Paul Smith - a concert with musical highlights of the season, some special guests and the launch for our exciting plans for the 2019-20 season. Join Director of Education, Ann Wright for a journey through VCM's inspiring education work and its impact. Who does the Foundation reach? How do we deliver our projects? How do we measure the impact of our work? Ann will address these questions, introduce you to some of our projects, and give you a preview of our new partnership evaluation project with University College London and Hackney Music Service. Join VCM Friends to be invited to many wonderful and exclusive events. 'Music 4 Mums' is an evening of singing, celebration, spoken word and sisterhood. Featuring a stellar line up of female artists such as Imelda Staunton and special choral performances by Kings Place Choir, Great Ormand Street Staff and Parent Choir and Choir Baby, a choir for new Mums and Dads. 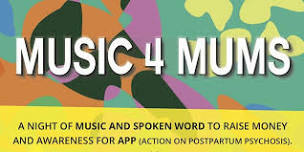 This event will raise money for APP, and launch their ‘Music 4 Mums’ campaign for 2019. This campaign aims to celebrate mums with musical events all over the country, raising awareness of the need for adequate maternal mental health care services in every area of the UK, and raising much-needed funds to support APP’s vital work supporting women and families affected by postpartum psychosis. Post-Partum Psychosis is a mental illness which affects 1 to 2 in every 1000 mothers, yet few people have ever even heard of it. An episode of psychosis is very frightening for mothers and their families. Episodes begin suddenly after childbirth and symptoms include hallucinations and delusions, often with mania, depression or confusion. Although most women do recover, many new mums suffering with mental health problems are not identified or treated and suicide is the second leading cause of death in post-partum women. This event is an opportunity for people to come together in support of each other, lending their voices to the voiceless and helping to stamp out the dangerous stigma attached to motherhood and mental health, whilst raising funds for Action on Postpartum Psychosis. Please add your voice to this important conversation by coming along. Every scrap of awareness and funding will go towards helping a Mum get back on her feet so she can enjoy her new baby and hold onto the future she deserves. Come along a support this young composer’s performance. The piece is a long drone on two tones resulting in a lush field of harmonics to fill and resonate our fabulous space. The ensemble is made up of performers and composers from the Guildhall School of music and Drama. 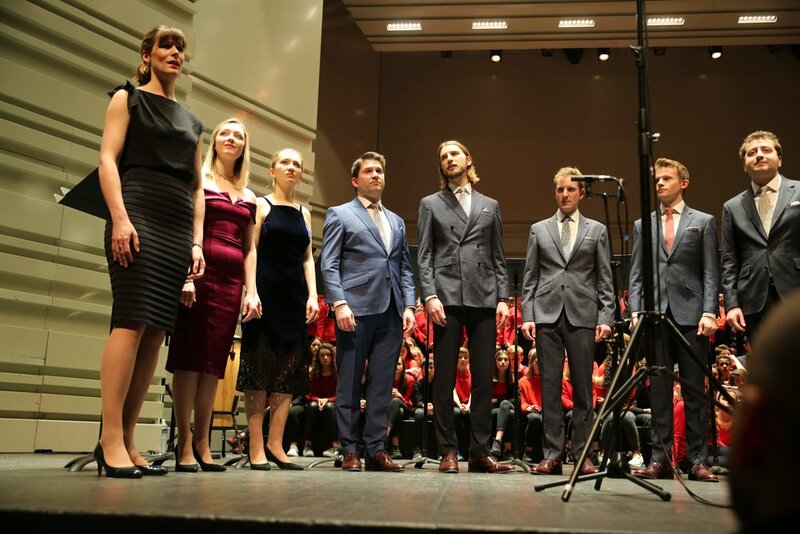 The final concert of this year’s ‘Roots’ project will be performed with VOCES8 on Tuesday 19 March in Trinity College Chapel, Cambridge, U.K. Download the final Programme here. The Gresham Centre welcomes back Pear O’Legs Records for a feast of Folk Music! The show will be celebrating Bill Jones’ return to music and the release of her first album in 15 years, which will be out in April 2019. As a BBC Radio 2 Folk Award winner, multi-instrumentalist and beautiful singer, this is going to be a show not to be missed. Bill (Belinda) Jones is an English folk singer/songwriter, who started her career in 1999, winning a BBC Radio 2 Folk Award (Horizon Award) in 2001. Three studio albums later (Turn to Me, Panchpuran, and Two Year Winter), countless festival appearances, and tours across the UK, USA, and Japan, Bill took a long break in 2004 to raise her family. Back then a young singer, Bill received accolades from audiences across the folk and acoustic music scene. Live sessions on Radio 1’s Andy Kershaw Show, Radio 2’s Mike Harding Folk Show, and Radio 3’s In Tune programme followed, as well as an interview and live performance on Radio 4’s Woman’s Hour. Bill’s beautiful voice and catchy tunes led to a stream of messages over the years asking Bill if she is coming back, and now it’s finally time. Bill’s new album Wonderful Fairytale will be released in May 2019, with accompanying tour dates and summer festivals. The album was recorded in late 2018 at Ian Stephenson’s Simpson Street Studios. Bill is joined by Ian (double bass), JP Garde (violin/viola), Paul Stewart (guitar), Stephen Henderson (percussion), Miranda Sykes and Gareth Davies-Jones (harmony vocals). Wonderful Fairytale features both traditional songs, songs written by Bill, and songs by Bill and Anne Hills (USA). Please note, this event is not a VCM Foundation event. Please use the links above for ticket purchases and other queries. Concert by Apollo5 and the choir from the City of London Academy Shoreditch Park. In addition to performances by Apollo5, the guest choir will showcase the pieces they have learned and perform some of their own repertoire. City of London Academy Shoreditch Park opened in September 2017. Thanks to the generous support of Holman Fenwick Willan, the VCM Foundation is able to have a residency with the school helping to support the wonderful singing led by Music Teacher Hannah-Claire Cameron. The choir from City of London Academy Shoreditch Park will have a workshop with Paul and Apollo5. Guests are welcome to join this session to observe or participate as Paul and the group teach the singers some songs including new arrangements by Greg Link and Blake Morgan. Teachers, singing leaders, musicians who work with groups of all ages and abilities are welcome to join Paul and learn to use the Method. An opportunity to work with Paul learning the Method and how to lead it with groups of all ages and abilities. Witness one of our outreach programmes up close. Apollo 5 will be joined by Young Leaders from a Senior School in Ealing, working with younger children from an Ealing Primary School. VCM Friends are invited to attend VOCES8's closed rehearsal session at the Gresham Centre. Join us for our annual Christmas celebration! Drawing from our second professional recording “Allus”, launched on 1 December, we’ll be featuring extracts including music from Francis Poulenc, John Rutter, Trond Kverno and Ola Gjeilo, as well as repertoire new to Coro 94 from composers such as Kenneth Hesketh, Peter Warlock, Bob Chilcott, John Stainer and John Joubert. Coro 94 will be doing what it does best – performing exciting, heartfelt and moving renditions of sublime a cappella music suitable for the festive season, as well as music with the sensitive piano accompaniment of John Byron. It’s always an extraordinary concert with an atmosphere that truly marks the start of Christmas proper. London International Choir is 5 years old - a good reason to celebrate! Our showcase brings you the best of LIC: linguistic fun, crunchy chords, sky-high melodies, pumping bass-lines and cheesy key changes. From Classical to Bollywood, from Venezuela to the icy steppes of Russia, from the Middle Ages to the 21st Century, if it rocks, hums, raps, glides, elides or soars, we'll sing it. Join us on a magical journey through 10 seasons of the choir's life. and engages people of all ages to explore, develop and learn through music. Performed by members of VOCES8, Apollo5 and the VOCES8 Scholars. Performed by members of VOCES8, Apollo5 and the VOCES8 Scholars with the Academy of Ancient Music. VCM Friends are invited to attend Apollo5's closed rehearsal session at the Gresham Centre. Join Opus 48 and their music director David Crown for two extraordinary works - the Requiems of Fauré and Duruflé. We will be joined by world class instrumentalists, as well as vocal soloists Angela Simkin (mezzo-soprano) and Morgan Pearse (baritone), both currently singing at Covent Garden, English National Opera and beyond. Within the beautiful setting of the Gresham Centre in London, you will be transported by the beauty and fervour of these incredible pieces, and the passion and energy of this exciting new choir. Opus 48 – named in honour of Fauré’s Requiem – is a new medium-sized choral society for Oxfordshire. We deliver moving and beautifully sung concerts in a wide variety of venues, both across Oxfordshire and further afield. In the spirit of Bach’s own Friday night concerts with his students’ musical society at Zimmermann’s Coffee House in 1730s Leipzig, the LBS Bach Club creates a platform for emerging young artists today and a programme that young audiences can enjoy in a relaxed and contemporary style. The Artists this year are from the Yeomen Programme of the Musicians Company. Magnard Ensemble Wind Quintet (Susie Clements, Mana Shibata, Joseph Shiner, Catriona McDermid & Jonathan Farey) playing two Preludes & Fugues by Bach arr. Shiner and one of Shostakovich’s Preludes & Fugues arr. Shiner. Tickets FREE for 18-30s or £10 (all others) in advance from 01883 717372, or at the door from 7.15pm. Ramp Access for Wheelchairs. The concert is supported by the Musicians Company. LUNA ROSSA bring their shimmering, magical music to the Gresham Centre this Autumn as part of a major UK Tour. The Award-Winning group - who create '21st Century Acoustica' - will be celebrating the release of their hotly anticipated 3rd album. This exclusive show will feature the live performance of every song from this breathtaking new album, in its entirety; plus a wonderful selection of the most popular music from the group's first 2 critically acclaimed albums. This will be the only Luna Rossa show in London for 2018, so you can expect a truly unique and memorable evening. A special invitation for VCM Friends to be a part of our Apollo5 workshop and celebration concert with 3 classes from Tower Hamlets Schools. VCM Friends are invited to attend VOCES8's closed recording session at the Gresham Centre.